HAWAII ISLAND (HawaiiNewsNow) - Emergency crews rushed four people to the hospital on Hawaii Island Tuesday after a three-vehicle crash in Kailua-Kona. According to the Hawaii County Fire Department, the crash happened just before 9 a.m. on Queen Kaahumanu Highway near Kaupulehu Drive. Officials said a truck and its trailer, a Jeep and an SUV were involved in the crash. 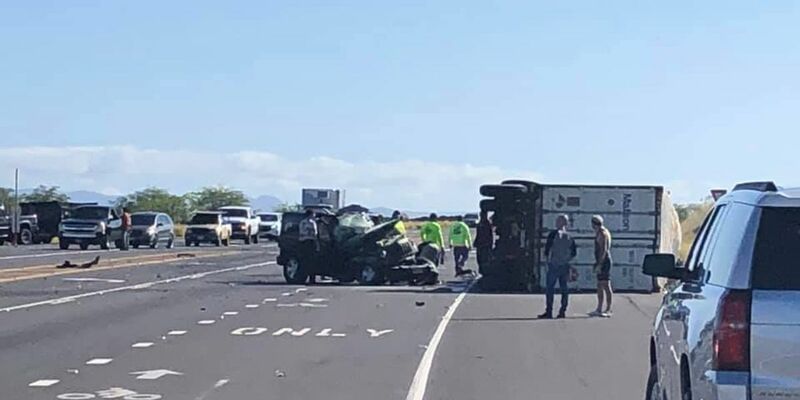 The truck was heading south on the Highway when the Jeep reportedly pulled out of Kaupulehu Drive in front of the truck. The driver of the truck swerved in an unsuccessful attempt to avoid the Jeep. The truck and trailer then fishtailed, struck the SUV and overturned onto its side, fire officials said. Emergency responders transported a 24-year-old woman from the Jeep, a 54-year-old driver of the tractor trailer, and the 63-year-old driver of the SUV to the North Hawaii Community Hospital. A fourth patient, a 25-year-old man, was air lifted to the Kona Hospital in serious condition. All roads in the area have since been cleared and are reopen.